DENMARK, SC (courtesy episcopalnewsservice.com, carolinapanorama.com, and nasa.gov) — Calling on his students and colleagues to “think differently,” Dr. W. Franklin Evans was inaugurated on April 7 as the ninth president of Voorhees College, exactly 120 years to the day when educator Elizabeth Evelyn Wright opened the school for children of former slaves that grew into the College. 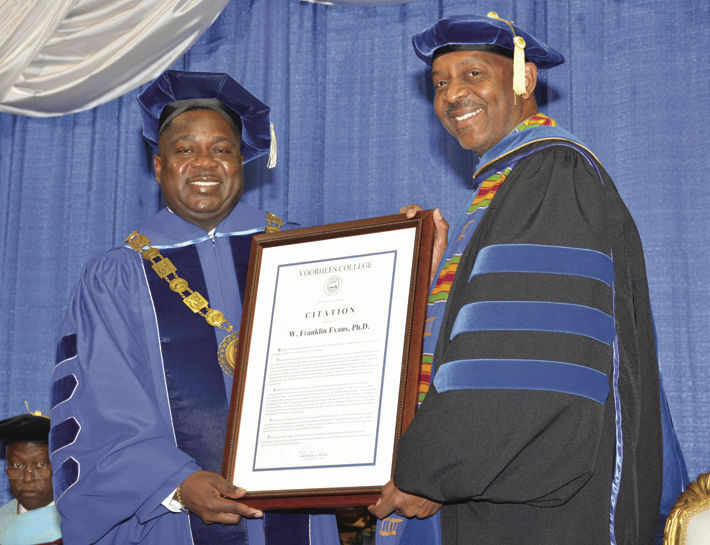 The ceremony was officiated by Dr. Robert Satcher, Jr., chairman of the Voorhees College Board of Trustees. Dr. Satcher, a Denmark, SC native, holds a PhD in chemical engineering from MIT and an MD from Harvard Medical School. Dr. Satcher’s professional background also includes serving as an astronaut with NASA. Beginning with STS-129 in November 2009, Dr. Satcher logged more than 259 hours in space. Evans faces a number of challenges: Voorhees is a small college of 600 students in a small town. Of Denmark, South Carolina’s 3,300 residents, 86 percent are African-American and 35 percent live below the poverty line. Voorhees cannot pay faculty and staff salaries to match those of larger institutions. Enrollment has been declining. The last decade has seen shrinkage in federal scholarship funds for low-income students. On the other hand, Voorhees may be able to benefit from the surge of interest in the country’s 107 historically black colleges and universities – those institutions of higher education established before 1964 to serve the African-American community. This primary focus is being broadened today to include other marginalized groups, including Hispanics. Evans is well-prepared for the challenge. His previous job was as interim president of South Carolina State University in Orangeburg, S.C., where he also had been provost and chief academic officer, responsible for faculty recruitment, strategic planning, and re-accreditation. Evans has declared boosting the enrollment and encouraging greater alumni support his two top priorities. His inauguration took place before an audience of 500. Bishop Gladstone (Skip) Adams of the Episcopal Church in South Carolina preached, and Bishop Andrew Waldo of the Diocese of Upper South Carolina celebrated the Eucharist.